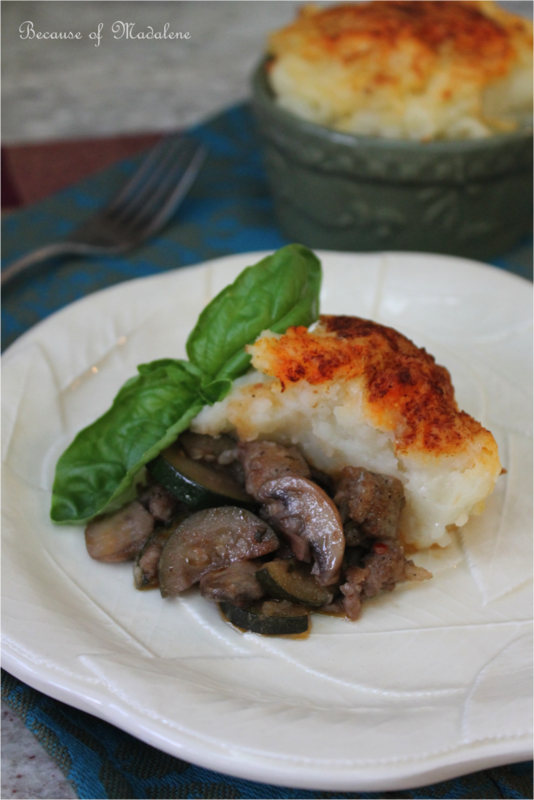 As a typical picky kid, mushrooms were the last veggie on earth I wanted to eat - get the pun? I know, it was bad, moving on... Their spongey and dirt-like characteristics were just too bizarre for me to ever want to associate with. But then one day, when I discovered these little foreign creatures could be smothered in butter and wine and topped on crispy crostini, they weren't so bad! In fact, they were absolutely delightful - covered in rich flavors to disguised their distinguished earthy taste, they quickly became one of my favorite veggies. This particular Italian recipe cured me of my mushroom phobia and eased me into the wild world of shroomy appreciation and love. 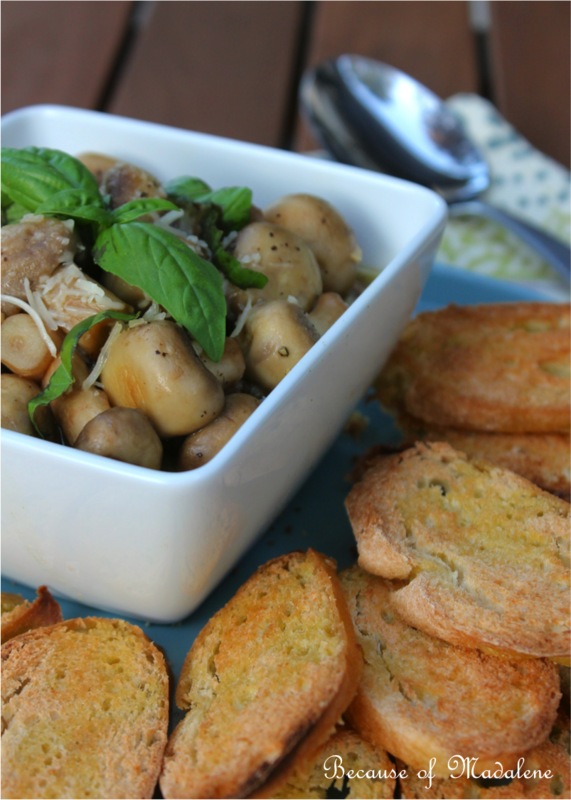 Now, any excuse to put mushrooms in a recipe, they're tossed in! Pizza, casseroles, salad… which is why they're due for more stardom than we often give them. There is no mistake that these buttoned shaped goodies are the center of deserving attention with this filling appetizer. And despite this dish typically considered as a starter plate, its heartiness can easily turn this into a small meal for one. In a large skillet over medium heat, add the olive oil and butter. Just as soon as the butter melts, toss in the garlic and stir to avoid burning. After a minute or two, add the mushrooms, salt and pepper and sauté for about 5 minutes. Depending on how much the mushrooms absorb the oil and butter, add another tbsp of oil if needed. Pour in the white wine, turn the heat down to medium-low heat and simmer for another 10 minutes. While the mushrooms are simmering, prep the crostini. On a foil-lined baking sheet, line up the baguette slices and drizzle with olive oil. Place in the broiler until crispy and golden brown, 5 minutes or less. 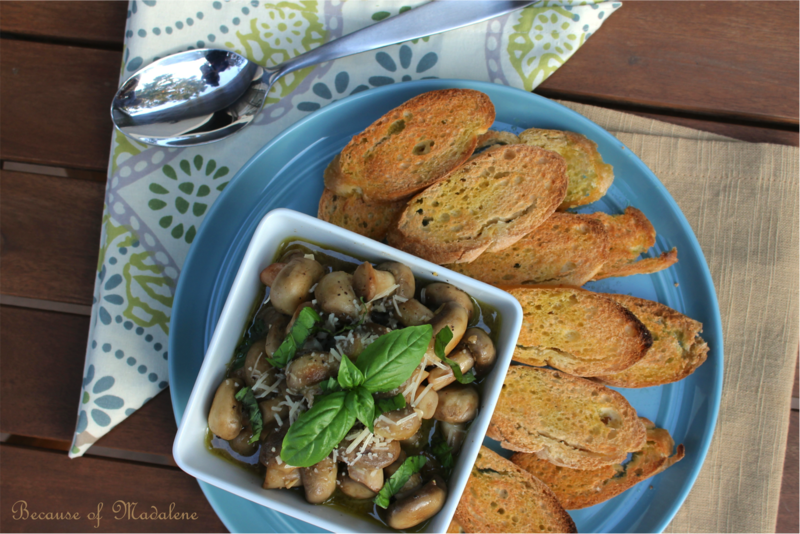 Transfer the mushrooms and sauce into a bowl, top with parmesan cheese and garnish with basil. Serve hot along side the toasted crostini on a platter or plate. It's finally here! 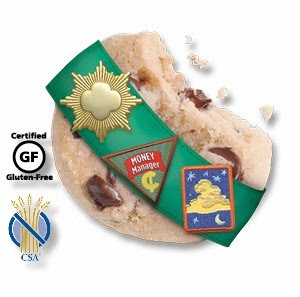 A buttery, chocolate chip cookie I can eat with no gluten qualms from my amazing fellow Girl Scouting Community. After 10 years of personally selling the famous array of American Cookies down the streets of my neighborhood and local grocery stores, this gluten free treat gets my vote for the smartest one they've done yet. Sure, it's no Thin Mint, but for a GF option, it's quite delicious. No complaints here. But be careful, they're super addicting (especially after a stressful day). And my bag was completely empty by day two... It's been a long week. I'm proud to see my Girls take one for the GF team. Hope this one is here to stay! Five more bags to my order, please. The Irish know what they're doing when it comes to potatoes. They've got their Shepherd's Pie down to a T. And whenever a specific dish is considered a staple for a certain culture or country (like the Irish's famous meat pie), I always think, "Well, why the heck don't the Italian make this? It's delicious!". Being an American instead of Italian born, it's too easy for me to constantly question this. I'm not the kind of girl who just eats pasta and bread everyday. I need some variety in my life. Otherwise, I'd be bored to death! I guess for many other cultures, their very specific cuisine is what they grew up with and all they know. But being fortunate enough to live in a melting pot community, it's fun to be able to taste somebody else's staple and give it my own cultural twist. An Italian Twist! Inspired by the ever so filling Irish Pie, this Italian version is made of spicy sausage, typical Italian veggies and herbs instead. 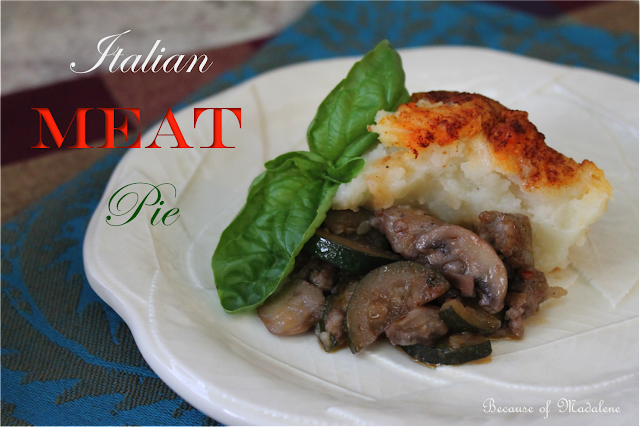 Reminiscent of the ole "meat and potato" days, this layered one pot wonder has just the amount of Italian flare to let you know that this bellywarming meal may be slightly different than the last meat pie you tasted but is just as scrumptious and satisfying. In a large fry pan on medium high heat, cook the ground sausage until cooked all the way through and broken up into small pieces (about 15 mins). While that's going, start your veggies in a different large fry pan on medium heat. Sauté the onions first in the olive oil (about 10 mins). Once they're clear, add in the garlic and stir (about 1 min). You don't want to burn the garlic! Then toss in the zucchini, mushrooms, herbs, crushed red pepper salt and black pepper (cook for about 15 mins), stirring occasionally. Pour in the wine and let cook for 5 mins over medium low heat. Turn down to low and let simmer for another 15 mins. While simmering, add in the tomato paste. Pour veggie mixture into the pan of sausage and stir until incorporated. Distribute meat mixture into 6 individualized baking dishes (at least 2 inches deep) or in a large pie dish. Boil the potatoes until soft for mashing (about 20 mins). Drain and mash. Add in the butter, warmed milk, salt and black pepper. Cover to keep warm until you're ready to layer on top of the finished meat/veggie mixture. 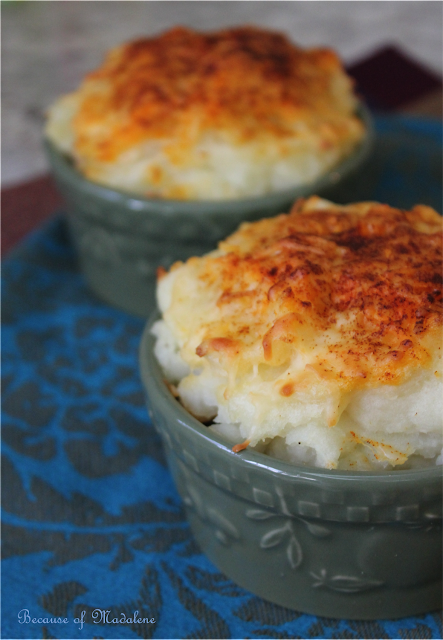 Spread the mashed potatoes over the meat and sprinkle the top with the shredded parmesan cheese and smoked paprika. Bake at 400 degrees for 30 minutes or until the cheese is golden brown. Eat while it's hot! 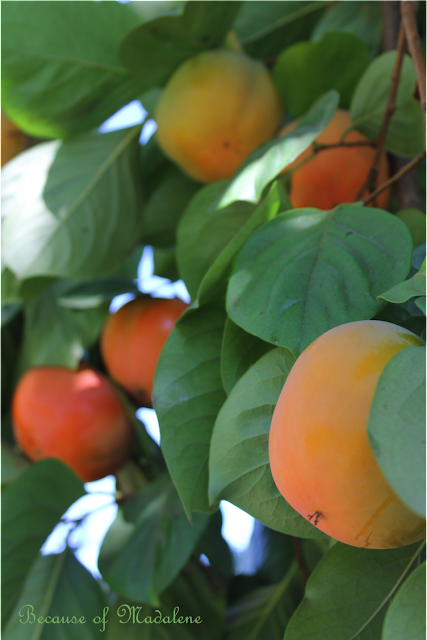 One of my fondest childhood memories is the huge persimmon tree in the backyard of my parents home. Whether it was its beautiful Fall leaves that would cover half of the entire yard or the accidental squish on your shoe from stepping in one that had fallen to its dreadful fate, despite how careful we thought we were being! But our golden retriever was smart and would avoid her bathroom area during persimmon season like the plague to avoid any unnecessary mess. And one year, we told the neighbor's gardener he could take some and we came back home to a completely stripped tree!! We asked for a few of his bagfuls back. It's a funny tree. For years it would only bloom fruit every other year until this year! And we have no idea why, but we aren't complaining because this isn't your everyday kind of fruit like an easily accessible apple or pear. Yes, you can find them in grocery stores when in season (that are perfectly fine to eat and cook with), but they are typically smaller and harder to come by. So we try to always take advantage of the short few weeks they are ripe and ready to be eaten by the slice or used in bread or cookies. Gluten free cookies tend to be on the dry side, which is why putting persimmons in your batch make one of the best GF treats. 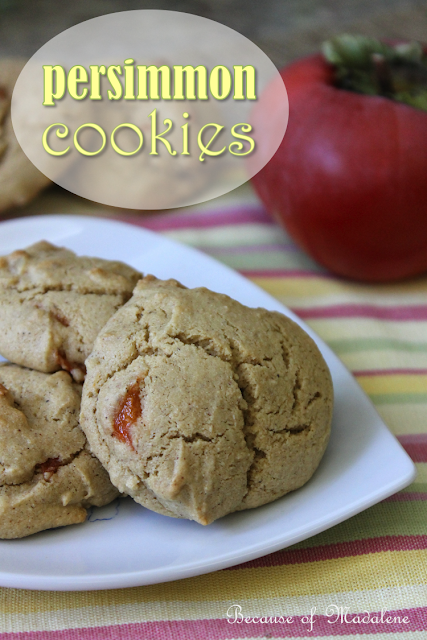 The entire cup of its pulp that is used in this recipe makes these cookies moist and fluffy! How often do you hear that about a GF goody?! And the taste of Fall is prevalent in this dessert with hints of cinnamon and nutmeg that go really well with this apple/tomato like tasting fruit. Preheat the oven to 350 degrees. In a medium size bowl, beat together the persimmon, butter, sugar and egg. Then add the flour, baking soda, cinnamon and nutmeg until completely incorporated. Fold in the walnuts. An inch apart, drop about a tablespoon of dough onto a cookie sheet lined with parchment paper. Cook for about 15 mins or until completely cooked through. Let cool and eat! Congratulations to Stacey from De Running Mom for winning the Holiday Wreath Giveaway! I'll be in touch soon. I've been in the craft mood lately more than cooking. Can you tell? I promise to have a tasty Fall treat on here soon! But maybe it's because it was Madalene's birthday a couple of weeks ago and I've been inspired by the Craft Queen herself to start creating again. Unfortunately, I never got to see any of her creations, but my mom was lucky enough to wear the clothes Madalene would make especially for her. I miss those days where crafts were apart of everyday life, whether it was sewing your own wardrobe, making something for the home, etc. Things were simpler back then. Nowadays I have to force myself to get home early from work to make something, anything - keep those juices flowin'! SO, I've been inspired to create my very own Etsy Shop, where I'll be selling these Raffia Wrapped Holiday Wreaths! I think the entrance to your home says a lot about you and what's inside, don't you agree? 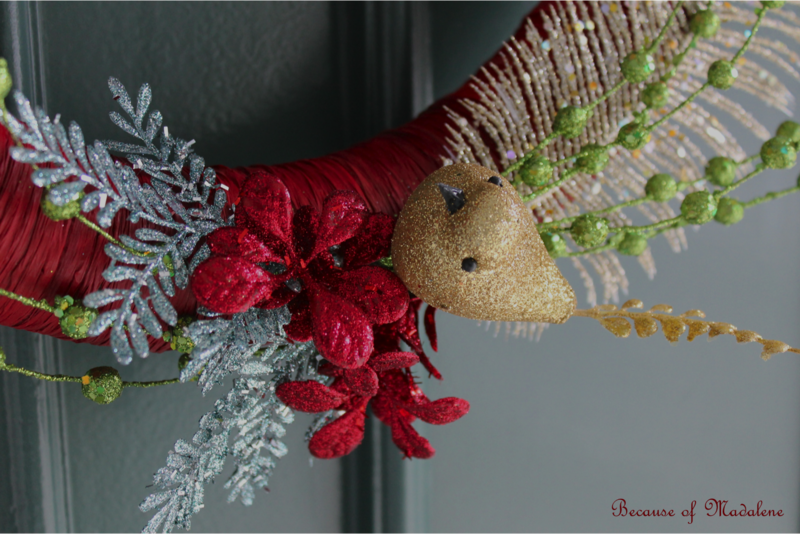 Dress up your front door this season with one of these homemade wreaths to create that warm, cozy and welcoming feeling that everyone wants for the upcoming Holidays. Even if you don't get those lights up on the house this year, at least the front porch will say, "Welcome and Happy Holidays". This decor makes great gifts for that creative mom, aunt, sister or grandma or makes an equally nice treat for your own home. Come on over and check them out! Remember last year's Autumn Wreath? 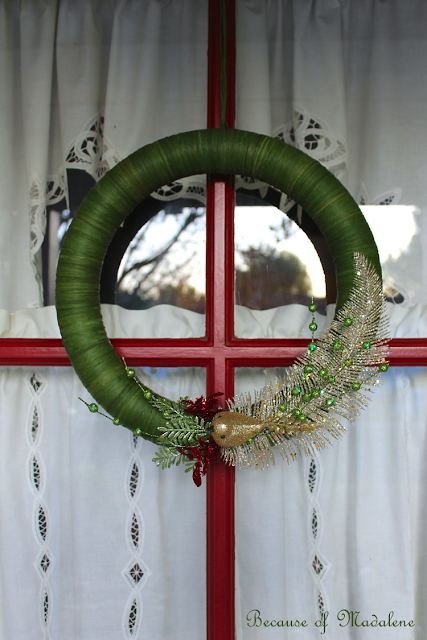 Well this year I've made a Holiday Wreath that will last all season long. 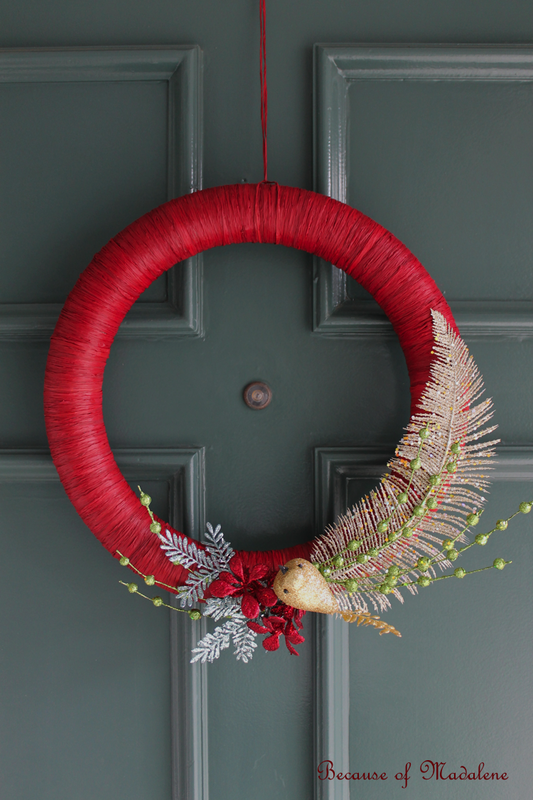 This raffia wreath is inviting, modern and homemade! 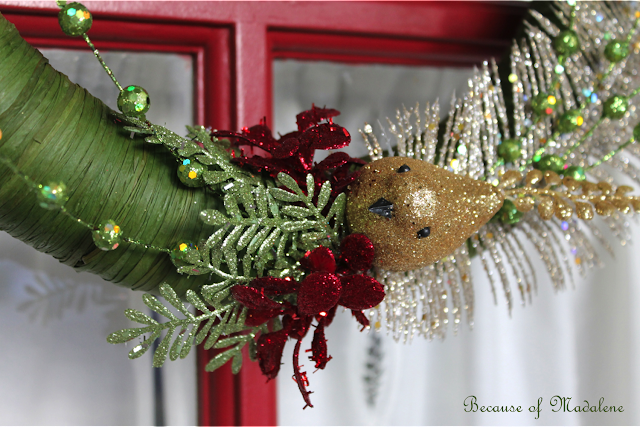 The perfect gift for a loved one or for your own door that will make the entrance to your home feel friendly and inviting for the upcoming Holidays. And guess what?! I'm giving it away to one lucky winner. - "Like" Because of Madalene on Facebook. - Follow Because of Madalene on Twitter. 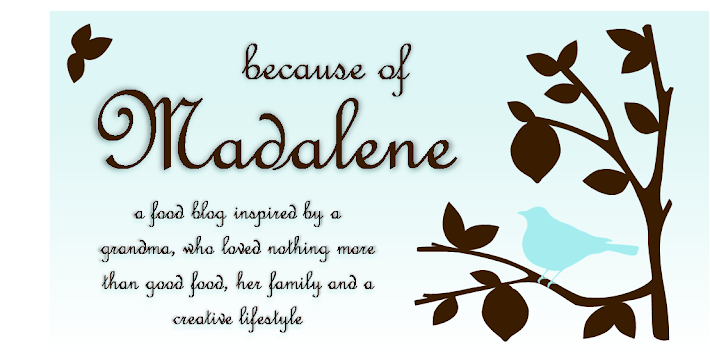 - Follow Because of Madalene on Pinterest. Leave a comment below letting me know what you've liked or followed and provide your email address so I can contact you. But I loved how my little whimsical Halloween scene came about and it also turned into a fun decor for the home. And even though Halloween is over, this versatile potting project could also be done for Thanksgiving by using pilgrim figurines or the winter Holidays by using a white cinderella pumpkin and winter scene houses instead. And because carved pumpkins only last so long, this garden will have to be transported in the next few days. But if you have a Thanksgiving or Holiday party coming up, this will make a fun conversation piece for the evening. Carve a very large hole out of the top of your pumpkin, large enough to fit your entire scene. Clean out the inside. Use a pumpkin sculpting tool to create the brick-like carvings on the outside wall of the pumpkin. Cut a rectangular piece out of the top part of the pumpkin for an interior wall. Add some brick-like carvings to this, too. Insert three toothpicks into the bottom of your interior wall piece and place into the pumpkin. This will stabilize the wall. Fill the pumpkin with potting soil and layer in your Halloween scene and succulents. Cover any exposed dirt with the pebbles. Once you're finished potting, water the succulents. Transfer a few days later into something else once the pumpkin starts to wilt.